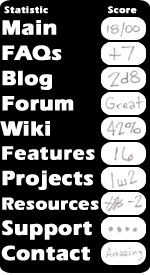 Back in 2000, I discovered the wonderful concept of buying books from used book stores on the internet, and decided right away that I needed to put together a collection of books that mentioned Dungeons & Dragons and roleplaying in a negative light. I quickly acquired copies of Mazes and Monsters, The Dungeon Master and The Devil's Web,and even found books like Cruel Doubt and The Embrace with ease, and began to build a little anti-gaming library, for reference purposes. During one of my searches, I found a listing for a book called Dungeons & Dragons, authored by none other than Patricia Pulling herself. Immensely curious, I eagerly clicked the "Buy" button, and waited by my mailbox for it to arrive. 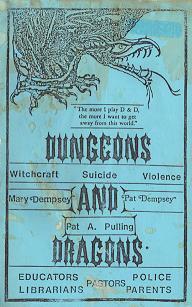 What had fallen into my hot little hands was none other than one of the booklets that Patricia Pulling and her fellow members of Bothered About Dungeons & Dragons would hand out to people - police, pastors, parents, teachers, and librarians - to help 'educate' them about this terrible 'danger.' It was a crowning jewel to any collection of anti-RPG propaganda. I've kept it tucked away for years and have often considered scanning the full book and posting the images on the site, but never got around to it. Recently (as of this writing), videos of the 60 Minutes "Dungeons & Dragons" story were posted to YouTube, which seemed to stir up some interest in the history of RPG controversy. So, I thought this booklet might be of even more interest - a glimpse into the mind of the people who deeply feared our little games of make-believe. One last word before you proceed - I've thought about adding commentary at the bottom of each page, but I realize that would take me months to complete. So rather than hold off on posting the images, I've decided to put them all up, and add my commentary when I find the time. That means that each time you visit, you may find a little more that I have posted since the last time.